Every experienced player knows, that his comfort is one of the most important things, which he should take care of. Long-lasting, exciting gameplay can be a real effort, and for that reason every gamer should look after his body’s wellness. 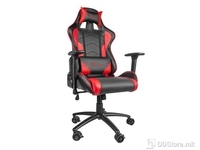 The first step should be securing the spine, which could be easily achieved by investing in good, properly contoured gaming chair. The Genesis Nitro880 is a chair, which will provide maximum comfort for every single gamer, even the most demanding one. The structure of the Nitro880 was made with high-quality, durable metal. The chassis made with that material guarantees high resistance to damages and ensures long years of operation. Moreover, the frame of chair contains the class 4 gas lift, which is able to bear up to 150 kilograms. Thanks to those solutions, the Nitro880 is very good choice for almost every single gamer. The Nitro880 characterises combination of high comfort with many functionalities. The product offers the seat’s height regulation in a range of 8-10 centimetres, as well as 3D armrests regulation. Another interesting functionality is ability to swing on the chair, which recently is gaining in popularity. Furthermore, the Nitro880 has adjustable backrest angle, which would be really appreciated among the gamers, who sometimes need some rest or a nap during the long-lasting gameplay. The seat’s upholstery is filled with high-quality, soft foam, which is 4 centimetres thick in the backrest and 7 centimetres in the seat. 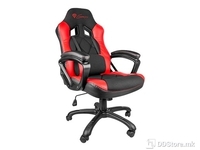 Moreover, both the seat and the backrest are properly profiled to ensure maximum comfort and to support the gamer’s spine. The Nitro 880 is covered with a durable, and high-quality eco leather. In addition, there are two soft cushions – one as a head rest, and the other one with the adjustable straps, to support appropriate part of the spine and improve the comfort.